Age is more than just a number. Age is beauty. And it’s true that many of the finest things in life are appreciated and loved more as the number of years they span grows. Homes especially benefit with the passing of time, as they hold the allure of yesteryear, stand out among others and become timeless beauties. Explore these homes that are letting their age shine. Built in 1914, this enchanting English Cottage is surrounded by gardens, terraces and panoramic views. Set high on Sasco Hill, it offers spectacular views of Southport Harbor, a golf course and Long Island Sound from all rooms and the spacious terrace. This distinctive home was built in 1799 and boasts an interesting past. The Melius family bought the house in 1912 and when R.W.G. Vail visited them in 1927 he was so inspired he wrote a memoir, A Visit to Reverie Farm, about his trip to this magical place. On the main level is the sunny living room with beamed ceiling and fireplace, a large formal dining room with fireplace and built-in corner cabinets, a family room with fireplace, and a library. 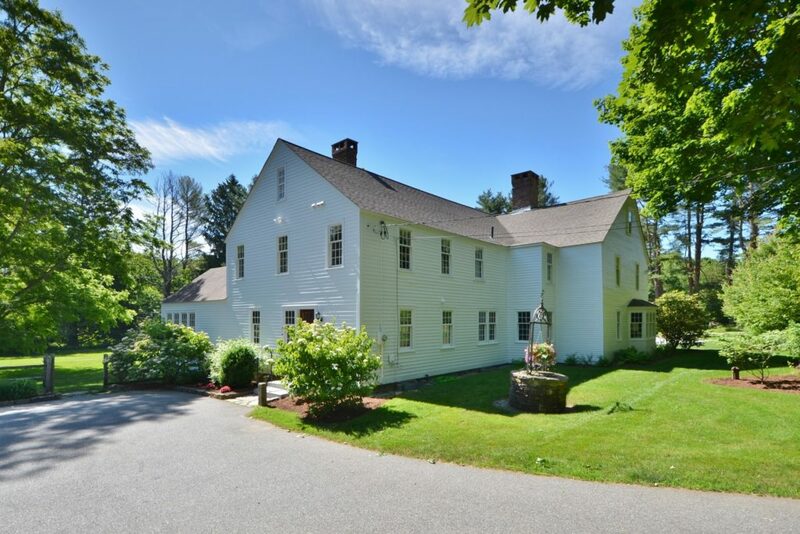 The property is conveniently located close to the villages of Warren and New Preston, the town beach on Lake Waramaug, Mohawk Mountain and the many other attractions that Litchfield County offers. Built in the 1800s, this stately five-bedroom antique is the centerpiece of Bird Pond Farm, a name inspired by the bucolic, private pond that rests within the boundaries of this nearly 8-acre property. The beauty of this home and the materials used to build it become apparent upon entry. Wide plank hardwoods on the floors and exposed beams on the ceilings have been conscientiously preserved. Windows frame picturesque views while natural light draws you from one room to the next – an especially lovely way to discover the formal living room with wood-burning fireplace and pocket doors that lead to a formal dining room well-suited for a large table and chairs. This home is a must-see for those seeking life well-lived in a quintessential New England setting. George Washington danced in this house, one of Connecticut’s oldest, when it was the Peck Tavern. 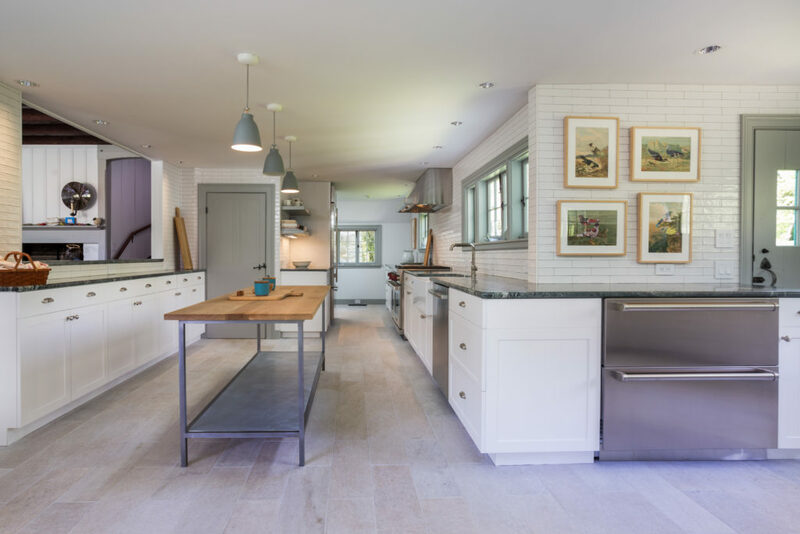 Beamed ceilings and corner posts are hand hewn, with wide board floors throughout. There is a gracious dining room with an original corner cupboard, double chandeliers and a large stone cooking fireplace with beehive oven. The home is recorded on The National Register of Historic Places and the barn is on the Connecticut Historic Trust Barn Tour. 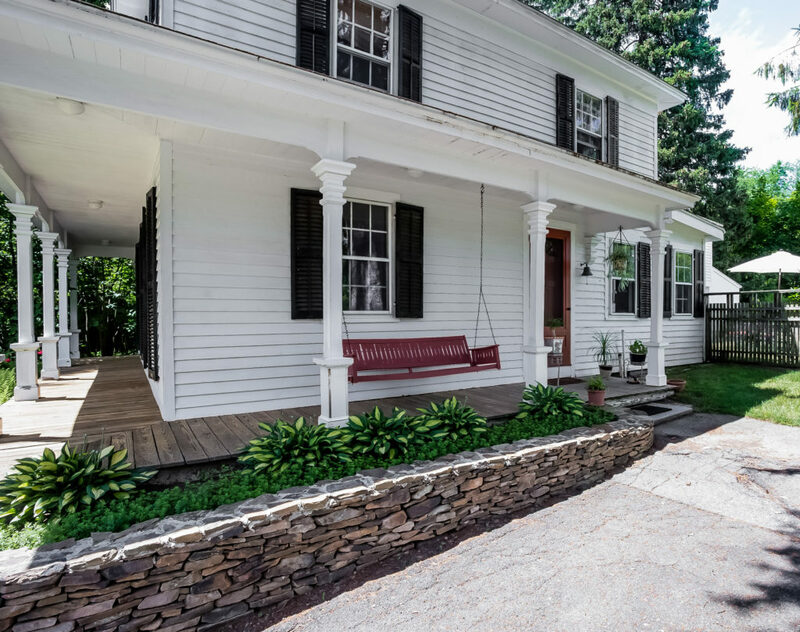 In West Hartford, a charming 1915 Colonial Revival located on over 1.5 acres sits high on South Main Street and is walking distance to the West Hartford Center shopping and dining districts. This expansive home is rich in character featuring a formal entry and foyer with the original staircase and banister, large formal living and dining rooms, and study, all which anchor the tradition of the home. As you enter the third floor to a private retreat, the story of the home continues as the oak hardwood floors turn to fir softwood, as was indicative of the era. The backyard is a complete escape from the vibrant West Hartford scene, offering a peaceful grounds with waterfall feature and a large lower field area that is perfect for backyard games. The whole package delivers a warm and inviting home that is perfect for entertaining and everyday living. Set amid Brookfield’s Historic District, this home was built around 1820 as a barn and totally restored in 2009. Original vintage details include hardwood wide plank floors, exposed beams, brick fireplace and expansive second floor landing/sitting area. Quality craftsmanship creates a home that’s functional, energy efficient, as well as a source of pride. An open concept design allows an effortless flow for entertaining and a comfortable rhythm for daily life. Originally built in 1790, this Norwalk, Conn., home has famous history. It once belonged to a Broadway legend and the original Peter Pan, Mary Martin. 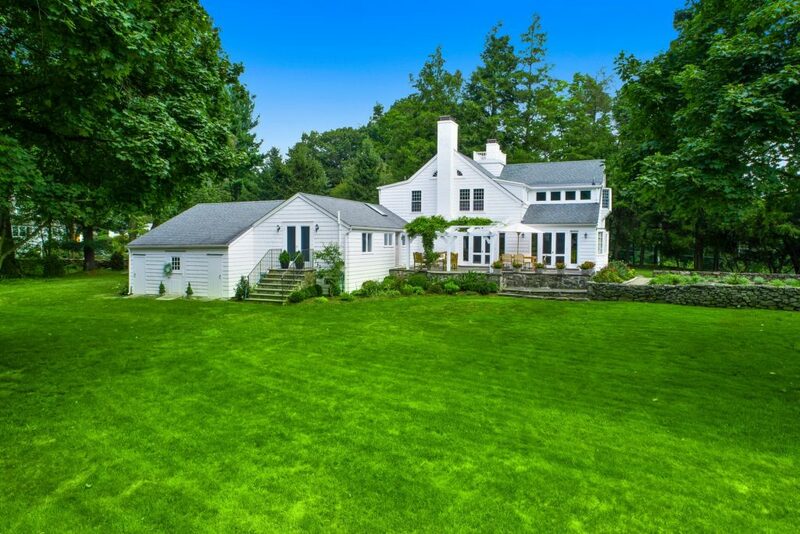 Enjoy lush views of 2.3 acres of rolling lawns, stacked Connecticut field stone walls, mature trees, and parterre garden from every well-appointed room. 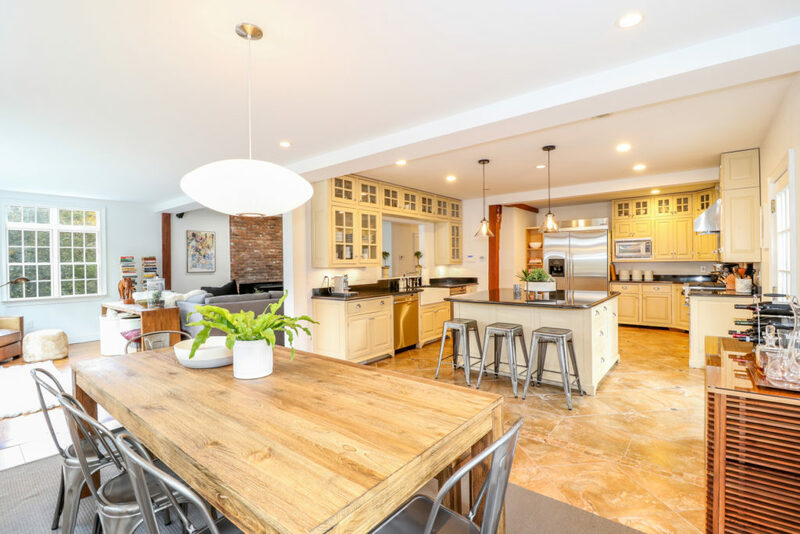 Highlights of the home include a double set of French doors that lead to a flagstone patio with sweeping wisteria and vintage lights from London that surround exterior doorways. Interior features include an open and bright kitchen and three deluxe bedrooms, all with luxurious ensuite baths. Exceptional entertaining space and an open floor plan make for easy hosting. Live the lavish lifestyle of a Hollywood star!